Spoiler Warning! 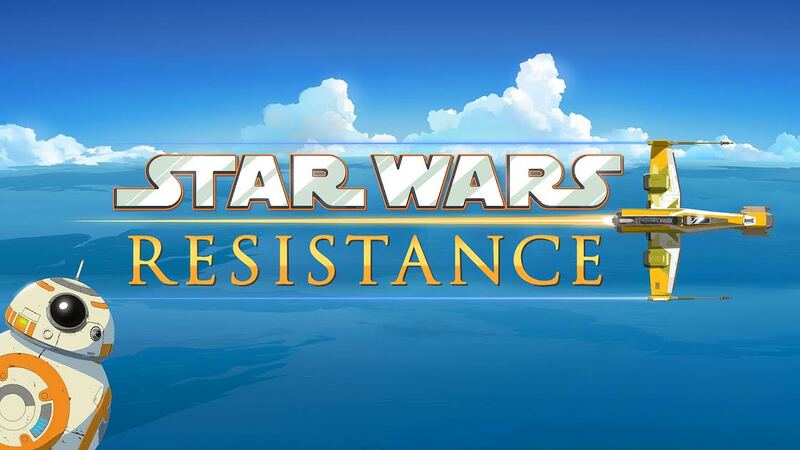 Episodic details are most certainly ahead. The fourth episode starts out the same way as the last with Kaz still working on his mechanic skills. With a race about to start, Yeager forces Kaz to finish his work rather than watch the race with the crew, setting up a bit tension between the two that would set the tone. BB-8 gives Kaz the idea to work on the Fireball’s engine from a vantage point where he can watch the race at the same time. They drag the engine to the edge of platform in view of the race but when the engine “burps” it falls off the platform and into the sea. Yeager lectures Kaz again on his responsibilities of balancing his spying with being a mechanic and it’s important he not attract unwanted attention. He sulks away to Aunt Z’s tavern and meets human racer Jace Rucklin (Elijah Wood) and his crew. He introduces Kaz around and they all talk about racing. They tell him that Yeager could likely be the best racer on Colossus if he wanted to be and that he has a secret ship that hardly anyone has seen. Jace takes Kaz racing on two speeder bikes which almost kills Kaz when his bike mysteriously malfunctions and explodes. Yeager shows up after they get back to the platform and scolds Kaz in front of his new friends. When they leave Jace tells Gorrak Wiles (Eric Bauza) that he did a good job setting up the bike to fail. So, this new group seems to be using Kaz, we just don’t know why yet. Back at the shop Kaz is frustrated with Yeager and even though Neeku warns him about his new friends, he sneaks away to hang out with Jace anyways. Once at Jace’s shop, they ask Kaz to sneak them into Yeager’s private shop to see his ship, but they are really after some Corellian Hyper Fuel. Feeling like he owes Jace for saving him earlier, he obliges against BB-8’s better judgement. So, Kaz sneaks Jace into Yeager’s private shop avoiding Bucket along the way. Once in there Kaz sees all of Yeager’s racing awards and a hologram of Yeager fighting with the Rebellion on Jakku and with his family on Batuu. Kaz didn’t know either of these facts and started to feel an uneasiness and guilt about letting Jace into the shop. They are interrupted by Yeager and Tam who are looking for Kaz. Tam is expressing frustration over Kaz’s lack of skills and not completing his work, but Yeager tells her to give him a break, just like he gave her one once upon a time. So, they leave without seeing the racer but unbeknownst to Kaz, Jace stole some Corellian Hyper Fuel that Yeager had, his intent all along. Afterwards, Bucket notices the missing fuel when he’s doing inventory and alerts Tam and Neeku. They are eager to find it because Corellian Hyper Fuel is highly unstable and whoever uses it improperly will essentially turn their ship into a flying bomb. Kaz knows it was Jace and takes off with BB-8 to stop him from entering the race before it’s too late. Kaz jumps on Jace’s ship just as it takes off, but the ejector seat engages, sending them both flying into the air. They are free falling and watch as Jace’s ship blows up from the unstable fuel. If not for BB-8 and Yeager lending a hand, they would have fallen into the sea. Afterwards, Jace blames Kaz for the plan going wrong and threatens him, telling him it’s not over between the two of them. Yeager over hears their fight, learning they played a part in stealing the hyper fuel, but doesn’t want to attract any unwanted attention. 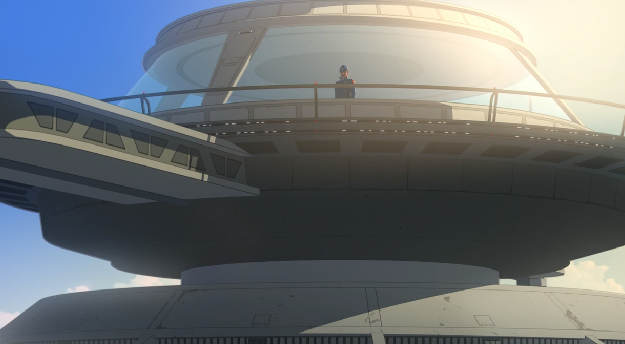 He looks out the window and sees Captain Doza watching over the events from the command tower. It seems clear, Yeager and Doza have some sort of relationship that involves what’s going on with Colossus and the First Order. Kaz feels bad and is expecting to be fired by Yeager but is surprised to learn that Yeager likes him and wants to keep him around. 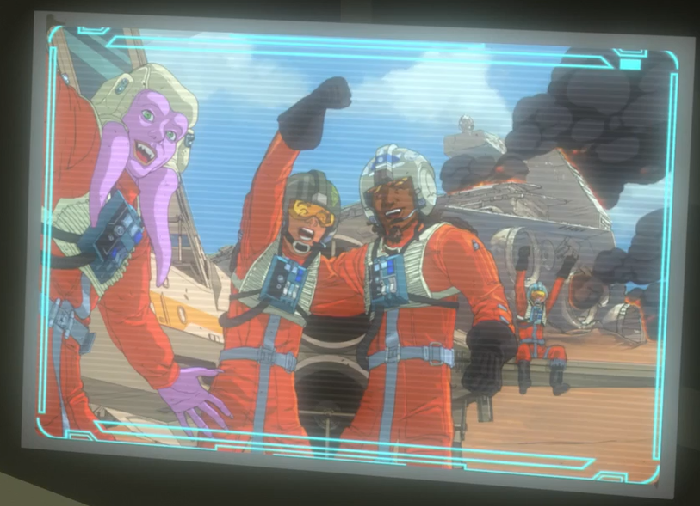 In a final gesture of good will, Yeager gets Kaz to clean parts, but this time in full view of the races. The episode bookends with the parts falling off the platform again as Kaz and the others watch the race. Another episode where certain parts are still coming together and others not at all. With a large cast of characters, it’s simply just going to take time to flesh them all out. But with this show, it’s about looking between the lines. That simple moment at the end where Yeager sees Captain Doza observing their behaviours from his command center says a lot about their relationship and the state of things on the fuelling station. Whatever secrets are on Colossus, it’s obvious Yeager and Doza are keen to keep them just that. We learned some key facts about Yeager’s backstory as well. 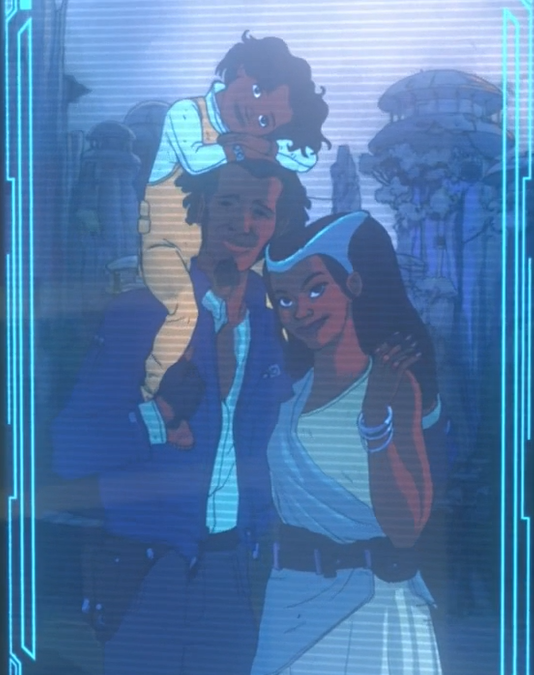 We learned he had a family and at one point they were on Batuu. Were they living there or just visiting? And where are his family now? These are questions which I’d bet will remain unanswered for some time, so the writers can maintain the ambiguous nature of his intentions. We learned, but already suspected, he flew for the Rebel Alliance and was present during the Battle on Jakku. This fact isn’t important, but what is important is what exactly happened that made him turn away from his service and seek a life on Colossus? Is that decision connected to the absence of his family? Will Jace Rucklin and his group return to cause more trouble for Kaz? Not likely but Colossus isn’t big enough to avoid them either. They were there for mostly expositional purposes and create a little conflict between Yeager and Kaz, so they could eventually find resolution. This isn’t the best episode of this still very young series but as things move along, I’m sure the intrigue as to who is siding with who, will only grow. 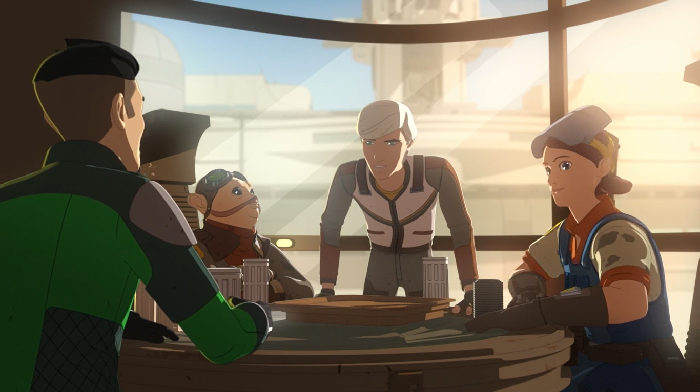 With the next episode, “The High Tower”, featuring a visit from the First Order, business is about to pick up and we’re about to learn quite a bit about Captain Doza’s relationship with them.